The Society for Women Engineers (SWE) Above and Beyond Award recognizes the year’s most outstanding outreach partner institution. 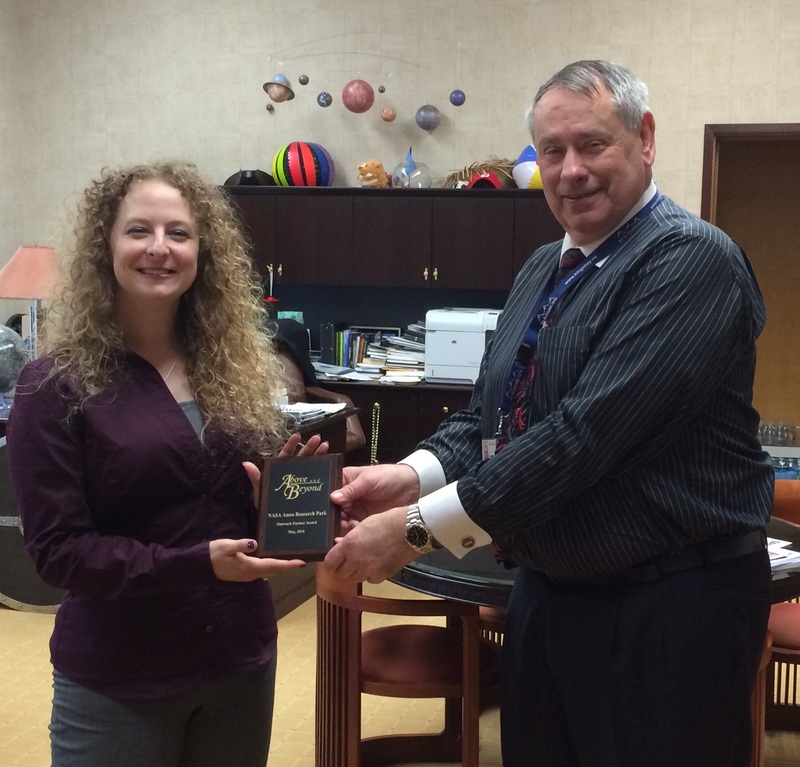 For the award year of 2013-2014 SWE chose NASA Ames as the recipient and asked Dr. Kristin Yvonne Rozier to accept the award on NASA Ames’ behalf at the annual SWE awards ceremony on May 4, 2014. Dr. Rozier was selected to accept the award because of her contributions to SWE, including most recently designing and running a set of workshops on mathematical logic aimed at middle school girls. The workshop utilized the logic and knowledge reasoning skills of fun and games to introduce the girls to the formal verification techniques applied to life-critical systems at NASA; the students gave it the highest rating of all of the workshops at SWE’s 2014 “Wow! That’s Engineering!” event. The Above and Beyond Award is addressed to NASA Ames in appreciation of all of the efforts of three women engineers at this center. 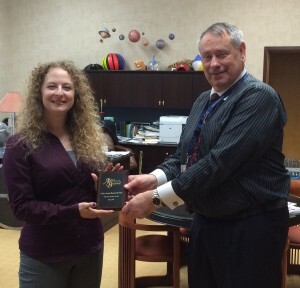 Dr. Rozier presented the Above and Beyond award to NASA Ames Center Director Pete Worden on May 8, 2014; the award is now on display in the awards case at the MegaBites Cafe. Other volunteers from NASA Ames whose work contributed to the Center receiving this award include Ali Guarneros Luna, who volunteered at SWE’s ‘Designing Women’ event in 2013; and Dr. Erika Rodriguez, who serves on the Executive Committee for the SWE Santa Clara Valley section.